Smart Device Integration, Lane Keeping Assist, Alloy Wheels, ALL-WEATHER FLOOR LINER PACKAGE, NIGHTSHADE SPECIAL EDITION PACKAGE. CELESTIAL SILVER exterior and BLACK interior, SE trim. FUEL EFFICIENT 39 MPG Hwy/28 MPG City! AND MORE! Back-Up Camera, iPod/MP3 Input, Onboard Communications System, Smart Device Integration, Lane Keeping Assist. MP3 Player, Aluminum Wheels, Keyless Entry, Remote Trunk Release, Steering Wheel Controls. NIGHTSHADE SPECIAL EDITION PACKAGE black wheels, Black Window Molding, Black Rear Spoiler, Black Rear Badges, Black Shark-Fin Antenna, Black Mirror Caps, Black Door Handles, ALL-WEATHER FLOOR LINER PACKAGE all-weather floor liners and cargo tray. Toyota SE with CELESTIAL SILVER exterior and BLACK interior features a 4 Cylinder Engine with 203 HP at 6600 RPM*. "On the highway, the Camry is comfortable and compliant. 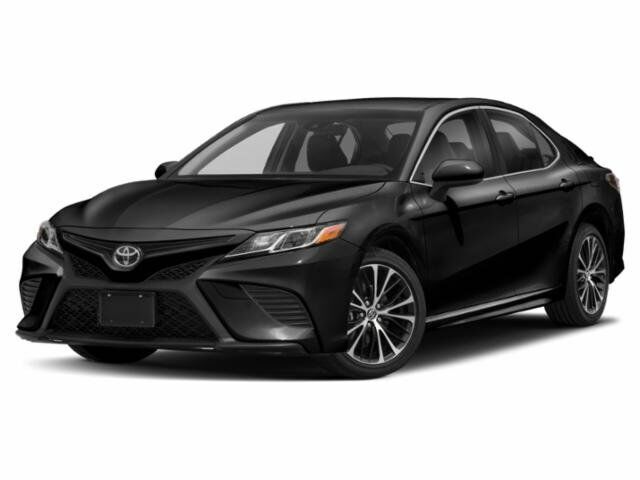 The Camry's big, comfortable seats, smooth ride and powerful climate control mean a pleasant experience for passengers of most sizes." -Edmunds.com. Child Safety Locks, Electronic Stability Control, Brake Assist, 4-Wheel ABS, 4-Wheel Disc Brakes, Tire Pressure Monitoring System Great Gas Mileage: 39 MPG Hwy.